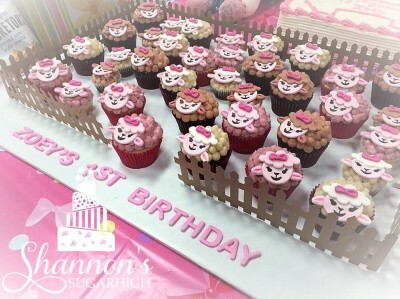 Cupcakes with printed fondant toppers. Includes Chase, Rocky, Rubble, Zuma, Marshall, & Skye. Printed edible sugar sheet fondant toppers. Confetti cupcake with Rice Krispie treat tire topper - cut view. Cupcakes with Rice Krispie treat tire covered in fondant and racing car flag pick. CREAMY CARROT - Carrot cake with cream cheese frosting and cinnamon cream cheese filling. 42nd birthday cupcakes with edible chocolate screws. Breakfast at Tiffany's theme cupcakes made to match cake and mini-cakes. LEMON DREAM - Lemon cake with lemon cream cheese frosting and lemon curd filling. Buttercream "fur" with fondant eyes, nose, and mouth. Made to match Elmo face cookies. Flame cupcakes made to match fireman/firetruck theme party. 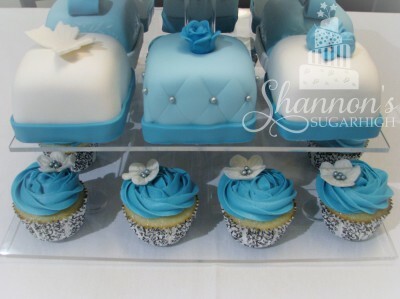 Brown, baby blue, white, and silver cupcakes. 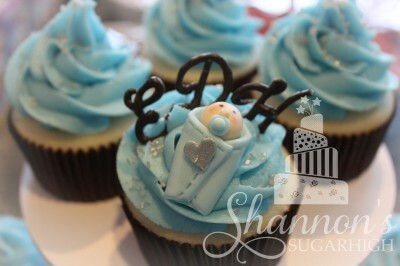 This one has a fondant baby in a blanket with the baby's initials. 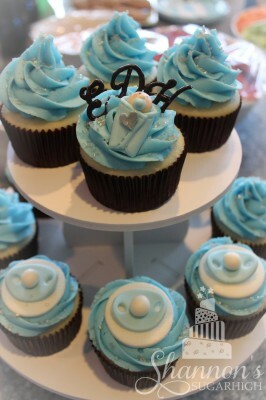 Brown, white, baby blue, and silver cupcakes with fondant pacifier toppers. Lego man cupcake with fondant Lego man topper. Lego block cupcakes with red, blue, green, and yellow white chocolate Lego block toppers. Mickey Mouse theme cupcakes with cocoa fondant ears. Nautical theme mini-cupcakes made to match cookies. Fondant flags and buoys and white chocolate anchors. Decorated cupcake made to accompany TMNT cake. Cupcake with fondant Batman topper. Pink buttercream flowers for a little girl's tea party. Claude Monet inspired cupcakes; variety of buttercream flowers. Fall cupcakes in gold foil liners with sugar paste pumpkin toppers. 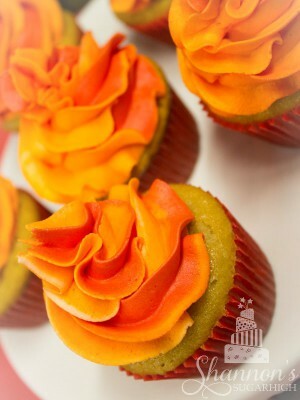 Candy corn cupcake. Yellow, orange, and white cupcake with a candy corn topper. Minion cupcakes with Funpix toppers by Wilton. Confetti Minion cupcake - cut view. MATCH MADE IN HEAVEN - Chocolate cake with PB buttercream and a Reese PB Cup surprise inside! TROPICAL LEMON - Lemon cake with coconut buttercream and lemon curd filling. 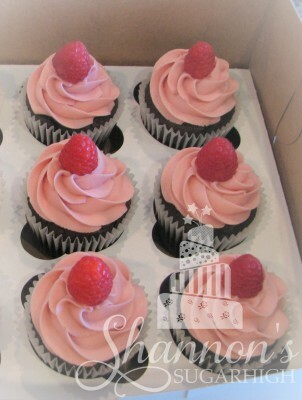 CHOCOLATE RASPBERRY RENDEZVOUS - Chocolate cake, raspberry buttercream, chocolate ganache filling. Cupcakes dusted with Oreo cookie baking crumbs and topped with fondant covered Rice Krispie treats. 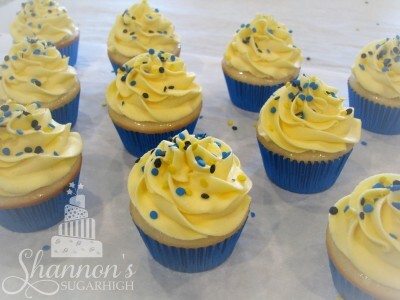 Blue, white, and yellow cupcakes. Fondant rubber ducky and round candy for bubble effect. Baby Girl Shower cupcakes in gold, white, and pink. Airbrushed fondant butterflies and small heart gold flakes. White chocolate golf ball topper and fondant golf tee. Teacher cupcakes with fondant toppers; apples, chalk board, crayons, and desk. Variety of mini cupcakes in light pink, red, and white with sprinkles. Cupcakes made to accompany "Wishes" Shopkins cake. Cupcakes with royal icing Dory and Nemo toppers. "Flame" buttercream with chocolate toppers including fireman hats, hydrants, firetrucks, and crests. Mini cupcakes with blue, red, and green buttercream and a yellow, white chocolate Lego block topper. Red pull-apart cupcake cake in the shape of #4. Autumn Spice, Creamy Carrot, Spiced Vanilla-Maple, & Chocolate Pumpkin. Blue, red, green, and yellow mini cupcakes with sprinkles. Pink and white cupcakes made to match a giant cupcake. Assorted cupcakes with fondant lamb faces on a decorative board with a fence. Gingerbread/cinnamon, chocolate/peppermint, red velvet/cream cheese, and vanilla candy cane/vanilla. Mini cupcakes with "galaxy effect" buttercream and a Star Wars pick. "Galaxy effect" buttercream with Star Wars cupcake liner and pick. Fondant toppers include pig, Steve, creeper, TNT, Enderman, dog. PGA The Masters golf cupcakes with a variety of toppers. Variety of flavours and designs with sprinkles for a little girl's birthday supper. Cupcakes with Superhero fondant toppers; Iron Man, Batman, Spiderman, Captain America, Hulk. Moana themed cupcakes; Moana, Maui, Hei Hei, Volcano Monster. Mini cupcakes for Easter; bunny ears, flowers, eggs. White chocolate bunny ears, flowers, eggs. Variety of fondant character toppers. Variety of fondant character toppers with special Charizard for birthday boy turning 6. 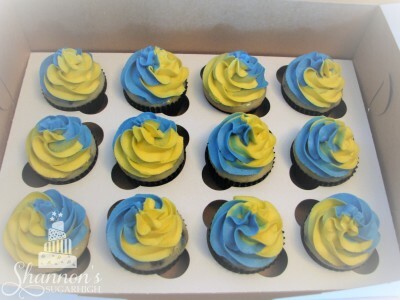 Blue and yellow swirl buttercream. Yellow buttercream, blue foil liners, and Minion coloured quins. 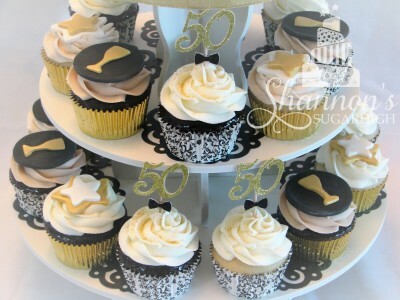 50th birthday cupcakes for him in black, white, and gold with a wine and bow tie theme. 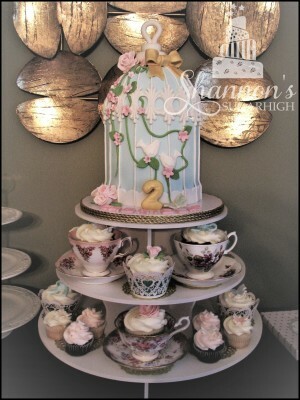 Cupcakes with fondant bows, butterflies, and flowers in theme colours of white, gold, aqua, and pink. Cupcakes with fondant bows, butterflies, and flowers. Some are placed in teacups.